The Florida Gators entered the 2018 baseball season the reigning National Champions and a red bullseye on their back. It’s not easy to go through a 56 game schedule when you’re the World Series for every opponent you face. 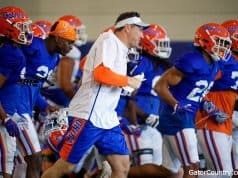 When the Gators clinched the SEC on the second to last weekend they said they would need to keep their edge. There were three games left in the season and then the SEC Tournament but human nature, a string of bad luck took over. Florida was 30-0 when leading after four innings. Freshman Tommy Mace had thrown six scoreless innings before the Bulldogs came back to win 6-3. The next day Brady Singer was scratched from his start with a sore hamstring and senior captain JJ Schwarz took a foul tip to the hand. Neither player would play the next week in the tournament. So, yes, the Gators are limping in to the NCAA Tournament, but their body of work earned them the No. 1 seed for the third time. 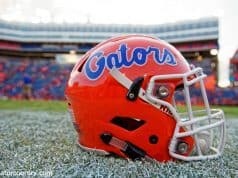 Florida is the first team to ever earn the No. 1 overall seed three times. That seeding means Florida will be at home for the rest of their season, where they were 28-6 this season. 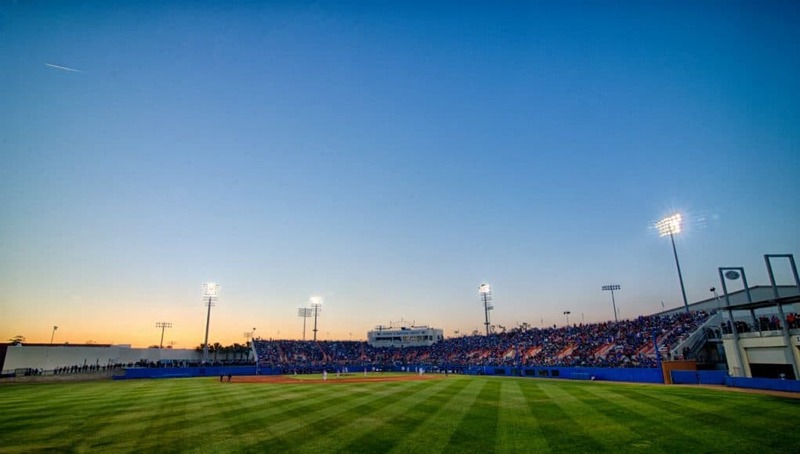 Florida’s road to Omaha begins the weekend at McKethan Stadium. Kevin O’Sullivan successfully asked for the Gatos to play in the first game this Friday, rather than the night game. Typically the top-ranked team plays in the night cap, but there have been seven delays in the last two NCAA tournaments held in Gainesville and O’Sullivan wanted to try and avoid that happening to his team this year. Here’s a snapshot of the Gainesville Regional and the Gatos road to Omaha. Friday – Game 2 – FAU @ Jacksonville – 6:30 p.m.
Saturday – Game 3 – loser of game 2 vs. loser of game 2 – 1 p.m.
Saturday – Game 4 – winner of game 1 vs. winner of game 2 – 7 p.m.
Sunday – Game 5 – winner of game 3 vs. loser of game 4 – 1 p.m.
Sunday – Game 6 – Winner of game 4 vs. Winner of game 5 – 6 p.m.
Monday (if necessary) – Winner of game 6 vs. Loser of game 6 – 1 p.m. 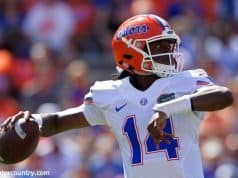 Season snapshot: The Gators got off to a hot start in 2018, winning theirs first seven games and 12 of their first 13. Florida won a National Championship last season with a dominant pitching staff but it’s been the offense that has carried them this season. Brady Singer – Florida’s ace has 10 wins on the season but, as stated above, missed his last two starts with a hamstring strain. Singer threw a bullpen Saturday in Hoover and O’Sullivan said it was “outstanding.” The junior is scheduled to pitch the second game of the Regional. JJ Schwarz – Schwarz is less likely to play this weekend. The senior is still recovering from an injury to his hand. Schwarz is listed as day-to-day. Season Snapshot: The Dolphins, who just secured its highest seeding in the NCAA Tournament ever, will be making their fourth trip to the Gainesville Regional. Jacksonville started its season this year against FAU and will do the same on Friday night when they square off against the Owls again. Scott Dubrule – The sophomore shortstop was named First Team All-A Sun. He hit .358 and second on the club with 52 RBI this season. Chris Gau – The Friday night starter for the Dolphins complied an 8-3 record and also hit a clean .375 in 37 at bats this season. Season snapshot: The Owls advanced to the CUSA conference tournament for the first time for the first time in school history before falling just short of the conference title. FAU beat Miami three times this season and split two games with UCF, who swept Florida earlier this season. David Miranda – Led the Owls with a .321 batting average and was named First Team All-CUSA. Tyler Frank – The junior shortstop was named the CUSA Defensive Player of the Year and was First Team All-Conference. He hit .315 with 15 home runs this season for the Owls. Season snapshot: The Lions earned a NCAA Tournament bid by winning the Ivy League this season. It was the longest game in the history of the Ivy League Championship. Columbia bested Yale in a 15-inning affair to win the league. After starting the season 3-15 Columbia the Lions played their way back into the tournament and head coach Brett Boretti earned Ivy League Coach of the year honors for turning his team’s season around. Chandler Bengston – The All-Ivy league first baseman leads the Lions with 10 home runs this season. Liam McGill – The sophomore catcher leads the Lions with a .319 batting average and hits (61). He played in and started all 48 games for Columbia this season. He was named to the All-Ivy second team this season.